HAMMERHEAD IS A PRIVATELY OWNED DIGITAL PRODUCTION STUDIO ESTABLISHED IN 1994 BY FOUR PARTNERS WHO HAVE MANY YEARS OF EXPERIENCE IN THE WORLD OF COMPUTER GRAPHICS AND FEATURE FILM VISUAL EFFECTS. THE FOUNDING MEMBERS, JAMIE DIXON, DAN CHUBA, THAD BEIER AND REBECCA MARIE, WERE FORMERLY THE SENIOR MANAGEMENT OF PACIFIC DATA IMAGES FEATURE FILM DIVISION. WHEN DREAMWORKS PURCHASED PDI, THE PARTNERS DECIDED TO START THEIR OWN COMPANY WITH THE INTENTION OF CREATING RESPONSIBLE, COST EFFECTIVE AND EXCITING VISUAL EFFECTS IN THE BIGGEST HOLLYWOOD MOVIES AND HAMMERHEAD WAS BORN! IN 2003 HAMMERHEAD OPENED ITS FIRST INTERNATIONAL STUDIO IN SEOUL, SOUTH KOREA. THE SEOUL STUDIO IS DEDICATED TO THE PRODUCTION OF HIGH QUALITY ANIMATION BASED ON IMPORTANT BRANDED CHARACTERS AND ICONIC STORIES FROM AROUND THE WORLD. IT HAS PRODUCED NINE ANIMATED FEATURE FILMS AND SPECIALIZES IN BRAND EXTENSION PROJECTS WITH CLIENTS SUCH AS THE CARTOON NETWORK, NICKELODEON, MATTEL AND ACTIVISION. IN 2004 HAMMERHEAD OPENED ITS FIRST LATIN AMERICAN STUDIO IN GUATELMALA. 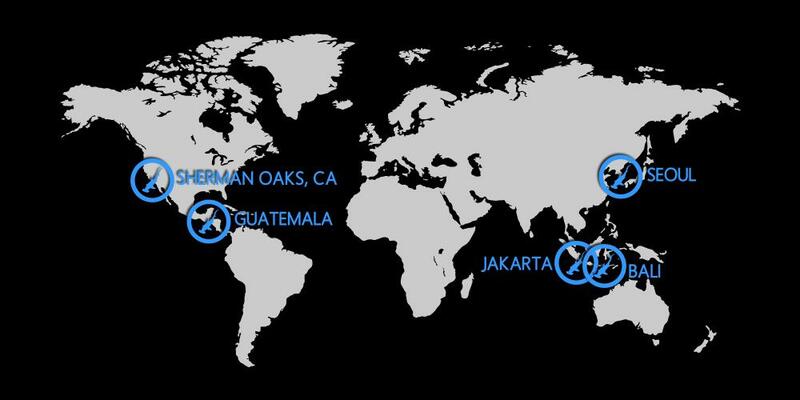 THE LATIN AMERICAN OPERATIONS NOW INCLUDE TWO STUDIOS IN VERACRUZ, MEXICO AND BOGOTA, COLUMBIA. IN 2009 THE AFFILIAT OFFICE IN JAKARTA WAS OPENED AS A SUPPORT OFFICE FOR OUR KOREAN STUDIO. A SECOND INDONESIAN STUDIO WAS OPENED IN BALI IN AUGUST 2014. HAMMERHEAD HAS DELIVERED HIGH END VISUAL EFFECTS IN OVER 100 FILMS FOR SONY PICTURES, UNIVERSAL STUDIOS, 20TH CENTURY FOX, PARAMOUNT, WARNER BROS. & LEGENDARY PICTURES IN ADDITION TO MANY OTHERS. IN 2014 HAMMERHEAD COMPLETED VISUAL EFFECTS ON 10 MAJOR MOTION PICTURES INCLUDING GODZILLA AND FURY. WE DIRECTED AND ANIMATED OCEAN QUEST, A DOMED THEME PARK EXPERIENCE FOR HAINAN ISLAND. WE CO-PRODUCED THE WIDE RELEASE LIVE ACTION THRILLER AS ABOVE, SO BELOW WITH LEGENDARY PICTURES AND WE RELEASED OUR 9TH ANIMATED FEATURE FILM BASED ON THE CLASSIC BEST SELLING BOOK, THE BOXCAR CHILDREN WITH EONE.